Although cancer xenograft models such as the SRG rat and SCID mice which lack a rodent immune system can effectively engraft and grow human cancer cells, humanized mice and rats engrafted with components of the human immune system may be ideal for answering human-specific questions on therapeutic immune responses and the tumor immune system environment. Humanized rodents are also beneficial for human-specific efficacy and safety studies as well as the discovery of novel therapeutics. Therefore, humanized models are often desired over more traditional syngeneic mouse models. 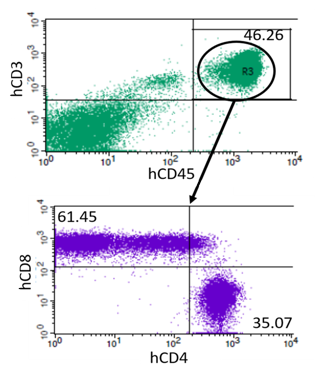 Hera has the unique ability to take a complementary approach for immuno-oncology studies, utilizing SRG rats humanized with peripheral blood mononuclear cells, NOD SCID mice, or NSG mice. Among other advantages, the SRG rat often has a higher tumor take rate and more favorable growth kinetics for cancer cell line xenografts and PDX models. Conversely, Hematopoietic stem cell (HSC) engraftment, ideal for longer term studies, is not yet available in the SRG rat but is well established in SCID mice such as NOD SCID and NSG mice. Human PBMCs were collected and injected into SRG rats for engraftment. By 4 weeks post-transplant, recipients had an average of 29% circulating human CD45+ cells. As of 10 weeks post-transplant, recipients have up to 46% human CD45+ cells and remain healthy. Download the AACR Poster on Humanization for full data. 5 NOG mice were pre-treated with 25-50mg/kg of busulfan, 24-48 hours pre-transplantation. 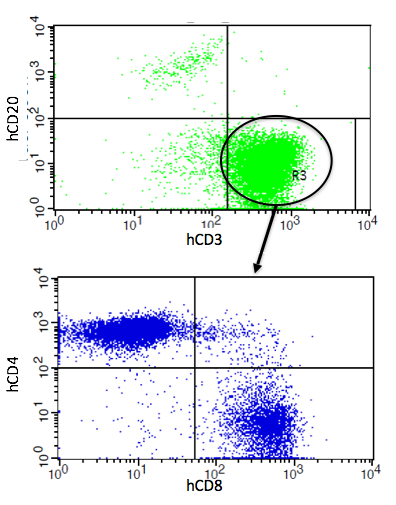 5e5 mobilized peripheral blood CD34+ HSCs were then transplanted in each mouse and engraftment monitored over time via flow cytometry. At 24 weeks post transplant an average of 29.4% of peripheral blood lymphocytes collected were hCD45+. 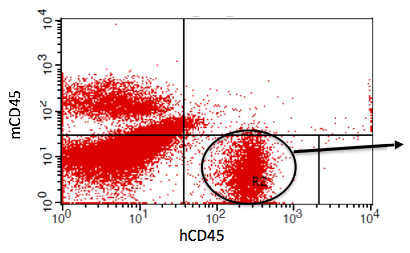 Of these hCD45+ cells, an average of 52% were CD3+ and 24.4% were CD20+.